This field of chrysanthemums is in Uruma City in Okinawa. The field is really lit up as bright as day, but the photographer has used some clever tricks to make it look more dramatic. Once upon a time, chrysanthemums were an autumn flower. In Japan they are still associated with the month of September, but nowadays we seem to think that nature should adapt to our convenience, not the other way around. Flowers are no exception, and chrysanthemums are much in demand in the springtime, so just how do you get autumnal flowers to bloom so early in the year? The secret is to take advantage of these flowers’ rather limited intellects – farmers have learned to trick them into thinking that spring is autumn, and in the process have created an unintended tourist attraction. You might think that flowers know when to bloom by keeping track of time, perhaps counting the number of days since they were planted, but that’s not how chrysanthemums work. They use a light-sensitive chemical called ‘phytochrome’ to measure how much time they spend in darkness. When autumn arrives and the nights get longer, this chemical tells chrysanthemums to bud, and once they’ve done that nothing can be done to stop them from flowering. Some time in the past, a clever farmer came up with the idea of tricking chrysanthemums into thinking it was still summer. 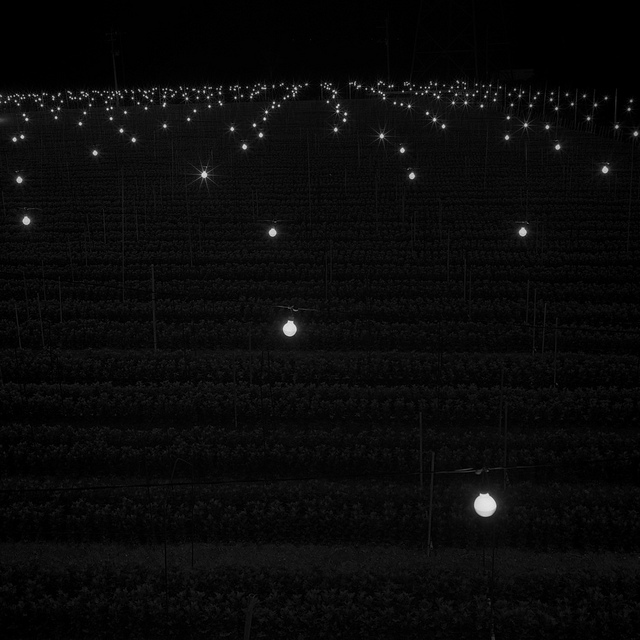 He strung electric lightbulbs over his fields so he could light them up at night. Sure enough, his chrysanthemums were fooled – they kept on waiting month after month for the nights to get dark. When he eventually switched the lights off, the flowers budded and then bloomed, just as though it really was autumn. 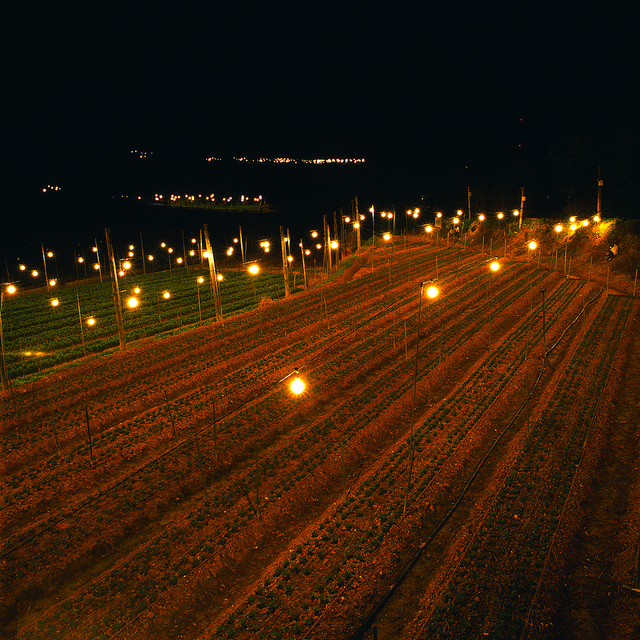 Japanese flower farmers have been illuminating their fields with electric lightbulbs since the 1930s, although for a period in the 1940s they had to switch to using gas lamps instead because of unreliable electricity supplies. Large-scale production began in the late 1940s, centring on the Atsumi Peninsula in Aichi Prefecture. Now this method is used nationwide, but the Atsumi Peninsula remains responsible for around 30% of national production. It might seem a lot easier just to settle for a daffodil or a tulip instead, but demand for spring chrysanthemums in Japan is so high that in parts of the country you can see whole hillsides lit up at night. Chrysanthemums are particularly valued at the time of the spring equinox in March, when they’re used in celebrations of the Buddhist festival of Higan, even though this is six months after their natural peak blooming time. Lightbulbs suspended over chrysanthemum plants create islands of light in the darkness in Okinawa City. At night, fields of chrysanthemums stand out as islands of light in a sea of darkness, creating a dramatic landscape that has become something of a sightseeing destination. On the Japanese mainland, chrysanthemums are grown mainly in greenhouses, so all you can see from the outside is a whitish glow. The real spectacle is to be found in Okinawa, in the far south of Japan, where chrysanthemums are grown in the open air. Fields of lightbulbs create surreal displays that emanate an unfamiliar aura – some people think it’s mysterious, while others describe it as ‘romantic’. Illuminated fields can be found scattered around the southern part of the Okinawan mainland, especially in Itoman City, and also in Kunigami District in the north of the island. Visitors are often treated to a great show when they fly into Naha airport at night, but you can also get an elevated view of the bright lights marooned amongst total darkness from the viewing platform atop Mount Otowadake. The lightbulbs are often not switched on until after eleven at night, when electricity becomes cheaper. Recently farmers have begun to replace lightbulbs with red LEDs, as they are both more energy efficient and longer-lasting. (Phytochrome is only sensitive to red light, so the plants can’t tell the difference.) Over time this change in technology is likely to create a whole new atmosphere, one that is even further removed from everyday experience. Trips to see the lightbulb fields have become established as an alternative from of recreation in Okinawa, a part of Japan that is better known for its sub-tropical climate and sandy beaches. As Okinawan cherry blossoms begin to bloom in January, you could even combine a trip to see lightbulb fields with a nocturnal hanami party. If you are able to make it to Okinawa in autumn or winter, happy lightbulb-viewing!